This fabulous, pavilion style home has been designed with a relaxing holiday in mind. Located in 'Beachfront Mirage' a prestigious gated residential area, the house is just a short stroll from the beach. Three separate pavilions create a space for everyone in the family. The main house has a living and dining area with a Stone Italiana kitchen concealing quality european appliances; perfect for the budding gourmet chef. A light and airy rumpus room in the second pavilion is perfect for the kids, equipped with a blackboard wall, a TV with separate Foxtel connection. The third guest pavilion faces a private patio and the nature reserve behind the property. This is a queen bedroom with en suite bathroom, a walk in robe and it's own TV. It would be perfect for a couple requiring a little extra privacy from the rest of the group. Upstairs there are three bedrooms, a Queen and Twin singles which open out to a wide balcony and share a family bathroom. Along an elevated walkway, the master king bedroom has another TV, a walk-in robe and an en-suite bathroom including spa bath, with a balcony overlooking the deck and fully fenced, heated swimming pool. In total this luxury accommodation has 4 TVs, Foxtel throughout and a wireless internet connection. The property has full air conditioning with fans throughout. 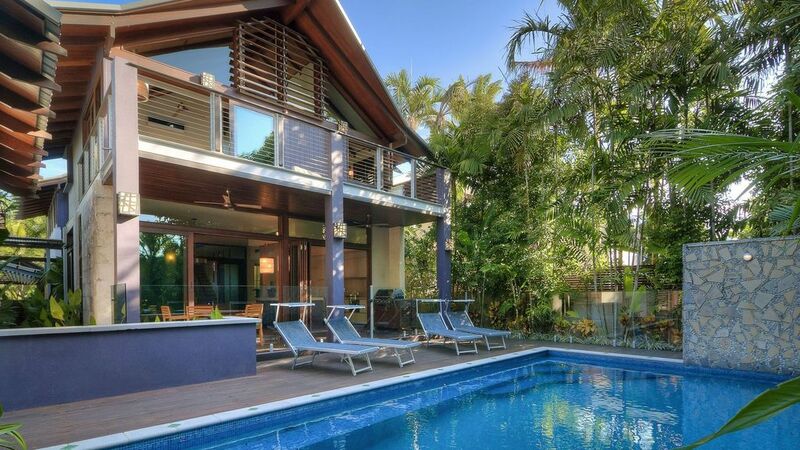 A perfect place to spend your Port Douglas holiday in total comfort and style.